Footage surfaced last month of Ari Folman’s next film The Congress. 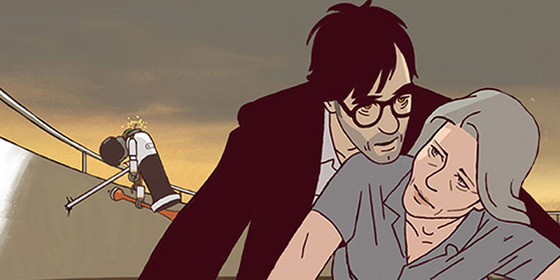 After winning huge acclaim for his stunning animated debut Waltz With Bashir (2008), Folman has adapated Stanislaw Lem’s 1971 sci-fi novel The Futurological Congress. The book deals with a man visiting a congress at a Hotel in Costa Rica and explores a futuristic world where hallucinations have replaced reality. Clips were recently screened at the Cartoon Movie festival in Lyon back in March where Folman explained that the film would have some notable differences to the book. A French-German co-production, live action footage will be shot in the US this summer and it will star Jon Hamm and Robin Wright (playing an analog of herself). The budget is a reported $11m (8m Euros), with half of that going on the animation (which is being done in France) and the release is scheduled for 2013.